This time, Timber Ridge Lodge & Waterpark shares its story. 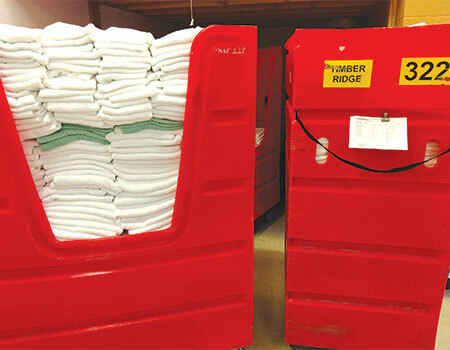 Timber Ridge Lodge & Waterpark uses the centralized laundry of Wisconsin Hospitality Linen Service (WHLS) in Milwaukee, a customer-owned goods (COG) plant with an extensive knowledge of the hospitality industry, located about 55 miles away from the property. He points out that because of using WHLS, Timber Ridge employees can be more guest-focused, rather than being concerned about laundry operations. “More time can be dedicated to customers,” he adds. According to Sebestyen, a centralized laundry service aids the property because WHLS can focus on laundry labor, being efficient and effective, and having the specialized equipment needed to process pound after pound of terry and linens. In terms of the labor benefit provided from using WHLS, he points out that with the “war” for finding talent in a low-unemployment economy, people are hard to find in certain areas of the country who will work in a laundry department. Speaking of equipment, he points out that centralized services have specialized equipment for laundry, especially to make hospitality linens as “user-friendly” as possible. WHLS says it uses state-of-the-art tunnel washers and dryers to process 10 million pounds of laundry annually. And while the service is nearly an hour away from Timber Ridge, which can be a cause for concern, Sebestyen is confident that the property will have all of the terry and linens it needs. He says WHLS picks up seven days a week, has 24-hour turnaround and provides a dedicated account manager. Check back Thursday for the conclusion with a look at in-house laundry.